Any warehouse inventory management requires arranging the inventory with accuracy. Yet, any discrepancy in the inventory can be possible. This only means that setting one application to the system would not suffice efficiency in the distribution agencies. But, thanks to the technological advancements today. A new process has been created to solve certain discrepancies in the inventory of these agencies. This is an advanced application called Inventory Discrepancy Resolution Process. And, this application can be integrated into the warehousing inventory management system. To ensure that this process can be installed and utilised, an industrial-grade PC is best suited for such multifaceted operation. By embedding the S12 industrial computer into the system, complex applications alike can also be optimised in the distribution agencies. How can this device be suitable computing solutions for these agencies? Find out more details on this blog on how can this device be used in these industries. Majority of the distribution agencies are now utilising a warehousing management system. This is to ensure that products or goods are checked and monitored. However, there are still discrepancies in any type of inventory. One of the main reasons behind it is due to incompatibility of the computing system being used. Another reason is that the utilised application requires additional software to resolve certain discrepancies. Whichever it may be, installing an industrial computing device like the S12 industrial PC can be ideal for these processes. This device bears a compatible operating system where industrial applications can be installed and used. So, it can provide accurate and real-time data for discrepancy resolution process. Do the existing computing equipment works efficiently if another application is installed on the system? Here’s how the S12 rugged industrial computers can be utilised in these operations. Note that distribution agencies usually operate 24 hours a day to meet the consumers’ demands. So, all equipment in the operations is frequently used including the computing system. Thus, it may have a possibility that the system will fail to operate. But, the S12 rugged industrial computers are made of industrial-grade components. These computers are designed to perform industrial applications like inventory discrepancy resolution process. Hence, any type of applications needed for an accurate inventory can function. Distribution agencies have fast-paced environments. Every space is utilised to accommodate the storage, delivery, and transport of products or goods. So, warehouses should have the proper lighting to make sure that every detail of a product is viewed clearly. Fortunately, the S12 industrial panel PCs can work in fast-paced environments as well. This device has 1280×800 resolutions with multiple mounting options. But, operators can still view clearer image of the data even if it is mounted because of its high definition resolution. What’s more, this device also includes projected capacitive touchscreen. Hence, operators can easily navigate the application by touching the screen displays. As a result, distribution processes for inventory discrepancy is also streamlined. Other computing systems manufacture AMD and ARM processors. But, the S12 industrial PC has an Intel-based computing system. It is compatible with a wider range and greater number of motherboards to operate. When it comes to processing and performance, this rugged computer allows more data to flow. It also increases the processing power of many applications such as performing calculations and processing data. 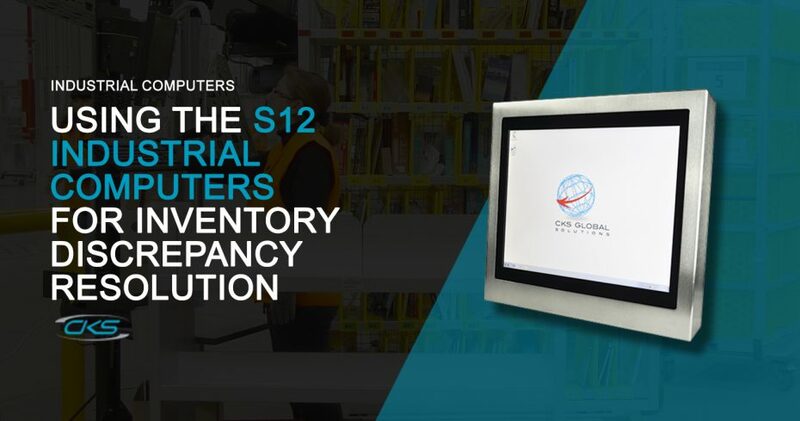 Therefore, a discrepancy resolution in the inventory can perform its function well on S12 industrial panel PCs. Besides inventory and checking system, errors or discrepancies may always occur. So, having a discrepancy resolution process in the inventory can help improve productivity in distribution operations. But, this also requires a reliable computing system. Thus, why not consider mounting S12 industrial panel PCs in distribution operations today?